This entry was posted in 1900s, Buildings, Great Lives, Shannon, Spotsylvania and tagged Civil Rights, Congress of Racial Equality, Fellowship of Reconciliation, Freedom Riders, James Farmer, Mary Washington College, Methodist, NAACP, World War II on April 18, 2008 by Neo-Rev. 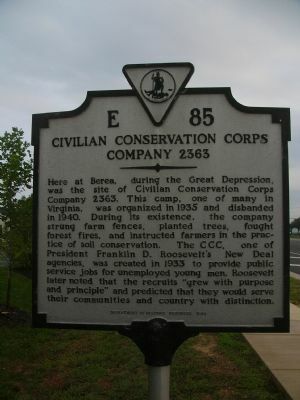 This entry was posted in 1900s, Elle, Other, Stafford and tagged Civilian Conservation Corps, Great Depression, New Deal, President Franklin D. Roosevelt on March 19, 2008 by eweaver. This entry was posted in 1800s, 1900s, Other, Stafford, Whitney and tagged gold mining, gold-pyrite belt, Stafford on March 12, 2008 by wholcomb. 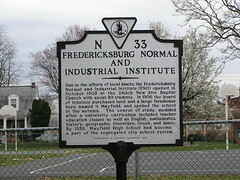 Due to the efforts of local blacks, the Fredericksburg Normal and Industrial Institute (FNII) opened in October 1905 at the Shiloh New Site Baptist Church with about 20 students. In 1906 the board of trustees purchased land and a large farmhouse here, named it Mayfield, and opened the school in the autumn. The course of study, modeled after a university curriculum included teacher education classes as well as English, mathematics, history, geography, literature, Greek, and music. By 1938, Mayfield High School had become a part of the segregated city school system. This entry was posted in 1900s, Early Settlement, Elle, Fredericksburg on February 28, 2008 by eweaver.